When I first heard of THE ENCHANTED, I was cautiously curious. I mean, I like darker books—ones that take place in unusual settings and with unreliable narrators—but I really had no idea what I was getting into. 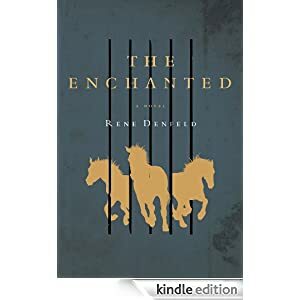 It’s like The Green Mile meets The Brothers Grimm with a touch of American Horror Story, which is a seriously intense combination that Rene Denfeld pulls off like a freaking boss. Another way I’d describe THE ENCHANTED would be like getting tickets to a symphony, but arriving to see one woman, sitting at a piano in the middle of the stage. You’re not sure what’s going on as she begins to play, because it sounds like she’s only using flats and sharps, and you're left squirming in your seat because it’s too strange a sound. But somehow, the song grows and evolves, eventually filling the room and bringing everyone to their feet for a standing ovation…which is when you realize that (a) you're weeping, and (b) the song hadn't gotten better because the pianist used different notes, but because somehow, those uncomfortable moments opened up your mind and you were truly able to hear the melody. In other words: The song didn't change, you changed. Whoa. That was deep. Haha! Okay, I may have gone overboard there, but THE ENCHANTED is an incredibly difficult book to review because of its uniqueness. It’s a book that’s full of contradictions, and not just the ones you’d expect. It flips the truth on its head and gives you an entirely different perspective, but only if you’re open to seeing it. The writing was elegant and, for lack of a better word, enchanting. (Way to pick a good title, Harper.) But it was haunting as well. The death row inmate who helps narrate the story escapes the badness of his life by re-imaging the world he lives in, giving the crumbling old prison a chance to be something else. And with descriptions like a pack of golden horses running underneath the prison, which the narrator uses when describing earthquakes, how could I not get swept away? We never learn the narrator's name, nor do we learn why he’s on death row (although there are some hints). Instead, the plot focuses on an investigator, the Lady, as she attempts to save another inmate’s life. We learn all about that inmate, both through Lady and the un-named prisoner narrator, and that’s where the theme of humanity really shines through. Kind of like a supernova, actually. From what you’re read of my review so far, I think it’s clear that this book isn’t for everyone, but it’s worth reading because it’s just so…excellent. Like, on every level: character development, imagery, craft, and the provoking plot is sewn into the prose like only the most talented writers can do. So if you’re in the market for an unexpected tale of darkness and humanity that will leave you wondering what the heck you just read (in the best possible way), then THE ENCHANTED is for you. Linking up with Heather for Book Club Friday! Mosey on over and rustle up some new reads! Haha! That does sound interesting! I don't know if I'd like it (sometimes, purple writing makes me gag), but the concept that the narrator is not the guy being saved or the gal doing the saving...that's awesome.